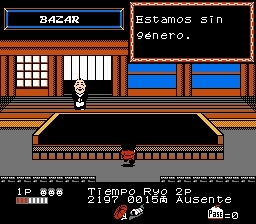 If you have to play any NES game, this is the game to play. Personally I love the music, which I believe is made possible by that VRC6 something or ever. It’s just fantastic. I would describe the gamplay as a romp through Japan causing all sorts of havoc with your partner in crime, Ebi. 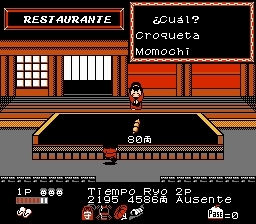 Did you know that this is the first game where Goemon has his fro and Ebi’s first appearance in the series? Great times. 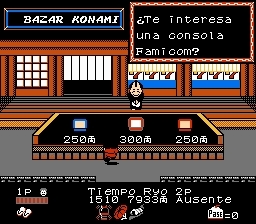 Spanish localization for the second Famicom Ganbare Goemon action game, only things left to translate are some signs like the EXIT one in the 3d Maze but the author does not think his art skills are up to the task. 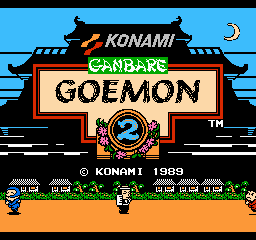 The game, ending and several in-game graphics have been fully localized. Spanish punctuation symbols and tilde were added. This translation is based on Stardust Crusaders previous great localization work and has only been possible thanks to their assistance. Full credit to all of them!